This item is not in-stock. BNG3000 | BN Products offers some great job site generators. Sizes range from 3,000 Watts to 7,500 Watts (rated run time). These units have all the features and benefits that you would expect on a quality generator. Our units are certified by both the EPA and California Air Resources Board (CARB). They all come with electric start (with pull start backup) and wheel kits that are standard on all sizes. Our 120 Duplex outlets are GFCI protected with 20 Amp levels and we included a 120/240 twist lock receptacle that is rated at 30 Amp. Contractors like our unit for its strong outer frame where they can stack items on top of the unit and not hurt the fuel tank. The tank is easy to fill and the fuel gauge is easy to read. The circuit breakers on the front add to the safety of the product. An important feature is the low oil warning light, and the engine will shut off automatically if the oil gets too low (protects the engine). Our never flat tires assure easy movement and long life. The engines are very durable and our fully copper alternator is an example of our quality. 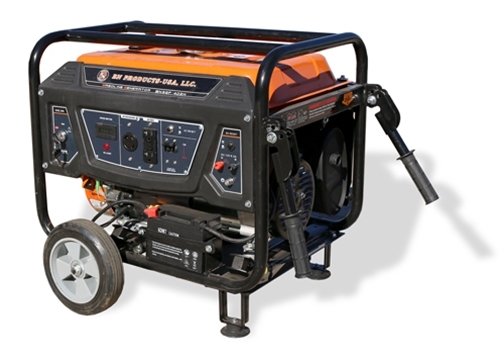 Our generators have a one year warranty and are priced at a very affordable level. These generators are perfect for keeping your project going and supporting your team on the job! Unit Dimensions 23.25" x 17.5" x 18"